Now as everyone now knows, I've just returned back from my annual pilgrimage to Marmaris. To be honest I was shocked at how upmarket it has become, yes Strawbs, I know you will be gobsmacked, but it really has become a very high end resort. 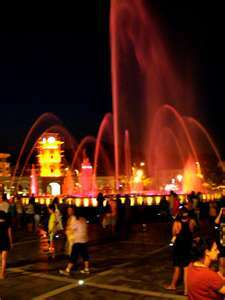 One of the main new features is the Water Fountain which dances to music and light at 9pm every evening. This is situated in the area where the old Tansas used to be. Now we all know how Turks and Kurds love freebies, so the area surrounding this spectacular fountain is heaving around 8.50pm with absolutely no where to plonk one's bottom as the megre seating arrangements have already long been occupied by the locals. So I thought up a plan to get them to move their arses in order for our party to sit down. You may wish to use this tactic yourself, its easy and affective. All you do is take out a Kleenex, have a good coughing session lasting on and off for about 30 seconds, look at the locals sat on the bench and say 'ben cok hasta, ben domuz gripi' Tell you what, they would have all won a gold medal in the olympics for moving their butts like flash lightening. I then put my tissue back in my handbag, and we have a huge seating and a panoramic view of the beautiful dancing fountain all to ourselves. It works in all public areas, including pazars, the dolmus, people pushing in front of the queue, getting rid of Turkish pests on the beach. Dont try it at the airport or in government offices, it may get you into trouble. You are so funny Rubes I can well see you doing that you naughty girl! That fountain is luverly isnt it!! Best way to get a turk out the way is to ask him for money!! bye bye!! Maria wrote: Best way to get a turk out the way is to ask him for money!! bye bye! !